A couple of unusual patients for Gold Coast paramedics this week. Two pets had to be treated for smoke inhalation, after being rescued from a house fire in Pimpama on Monday afternoon. Firefighters pulled the 7-month-old cattle dog puppy, Holden and Chip the kitten from the burning townhouse, and handed them straight to ambulance officers Jennie Chesters and Shelly Pringle for treatment. "You could tell they were quite affected by the smoke, they were quite floppy, they had glazed eyes and the weren't responding to us when we first got there," said Ms Chesters. 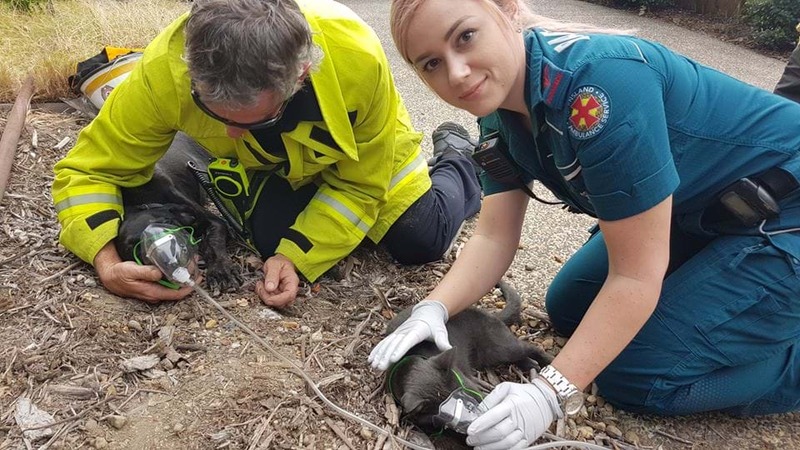 She said making sure the pets were OK and giving them oxygen, wasn't all that different to treating humans "apart from the shape of their faces, so we had the firefighters, who were really good, just holding [the masks] on properly". Thankfully, after being given some oxygen they were soon on the mend, and were later taken to the vet. "It's just a relief that what we could do, helped and they didn't get any sicker," said Ms Chesters. Investigators are looking into the cause of the fire, which ended up destroying the bottom level of the townhouse. At this stage it is being treated as suspicious.